There are a lot of reasons people think about moving to New Mexico. The beautiful southwestern American landscape, the weather, friends and family, the lack of traffic and crowds, the moderate cost of living. 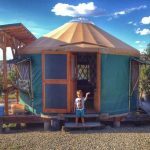 Even urbanites can appreciate what the Land of Enchantment brings to their otherwise quintessentially Santa Fe or Albuquerque experience. 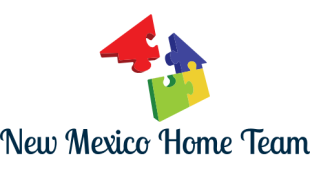 Historically, the housing styles in New Mexico can be broken down into three main building periods. Traditional pueblo homes date from some of the earliest New Mexican settlements up through the late 19th Century. Beginning in the 1880s, the railroad arrived in New Mexico, bringing with it, access to a much wider selection of building materials. The influential architects of their day began to experiment with housing materials they didn’t previously have access to including lumber and new types of stone. This period is loosely defined as the Greek Revival and continued from 1880 until around the start of World War I. Today, you can see these trends observed and resisted throughout the decades—as well as national house building trends. You can still find plenty of examples of mid-century modern homes that were built during the construction boom of the 60s and 70s. Many of the brick craftsmen that you see in other parts of the country have a heavier bent toward the pueblo style. Stucco and stone have remained popular for decades. On the other hand, you can find newer construction that emulates the Victorian style, for example, if you’re in love with angles and curved walls. 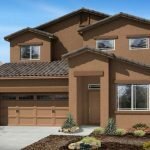 Along with green homes that are both eco-friendly and budget-friendly for monthly utility bills, perhaps the most common thread are the xeriscape lawns and landscaping themes. Even still, this characterization makes it sound like you won’t be able to find a home with a built-in sprinkler system and traditional grass lawn. And that’s not true, either. 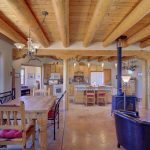 Here’s a solid photo gallery sample that shows both the common themes in New Mexico homes, as well as properties that defy expectations of what prospective buyers can find in the Land of Enchantment. 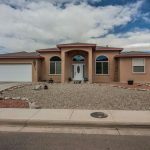 Here, we have a trio of existing homes and new home builds that combine traditional home facades and curb appeal with xeriscaped yards that are very popular in New Mexico and its water conservation habits. 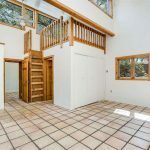 With these three homes, even more of the traditional pueblo style home is retained. 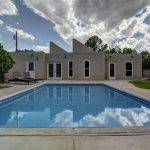 Again, in New Mexico it’s often the home exterior that evokes the quaint and charming feel. 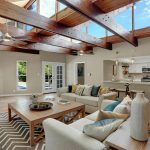 The interior of these homes, however, may instead elicit a wow factor of modern design and functionality with the open floor plans these home styles allow. From left to right: The yurt could rightfully be called the pueblo of today. This Victorian-evoking home build is from the 1990s. A mid-century modern home in New Mexico.